“We habitually erect a barrier called blame that keeps us from communicating genuinely with others, and we fortify it with our concepts of who's right and who's wrong. We do that with the people who are closest to us and we do it with political systems, and all kinds of things that we don't like about our associates, or our society. It is a very common, ancient, well-perfected device for trying to feel better. Blame others. Blaming is a way to protect your heart, trying to protect what is soft and open and tender in yourself. Rather than own that pain, we scramble to find some comfortable ground”. I love this quote from Pema Chodron. Some of us love the holidays, but for many, the biggest source of holiday stress is family. Fortunately, you have the power to change all that just by doing one thing and that would be simply changing your reaction. Nothing can hurt you when you feel peaceful inside, and creating an inner peace that endures is not as hard as it sounds. Understand that negative childhood experiences lead to feeling unloved. Holidays trigger those feelings. Look inside yourself for the truth. Don't let other people's opinions effect you. When you love yourself, it won't matter who else loves you. Pay attention to your thoughts. Destructive thinking patterns are our worst enemy. I know it can be extremely difficult to focus on the good when unpleasant things are happening in your life, but when difficult thoughts come up, shift them. Think of something you love and focus on it. After awhile, you can train your subconscious mind to look at life differently. Pema Chödrön describes it as turning your thinking upside down. I talk about this a lot, and I practice it in life. When I feel bad, I don't hide from it. If I am surrounded with negative energy, I dance with it. If someone is trying to make me feel bad, I wish them compassion. When I first learned this technique, I was surprised how easy my heart responded to it. Breathe in what is difficult to bear, pain, fear and just take it all in and acknowledge it, then breathe out relief. Actually, it is remarkably simple and just takes practice. Eventually I found that taking in the pain heightened my awareness of exactly where I was stuck. If you want to learn more about spirituality when facing difficult times, I highly recommend Pema Chödrön's book “When Things Fall Apart. Pema is one of the most influential voices in contemporary spirituality, and became the first American woman to become a fully ordained Buddhist nun in Tibetan tradition. On to food. 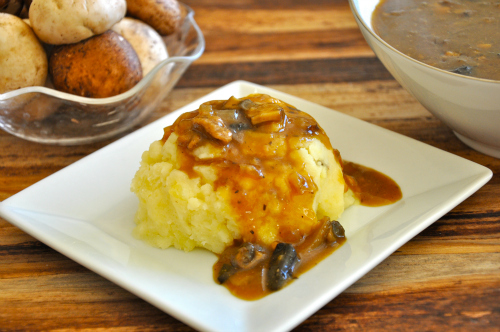 As promised, here is the recipe for the most delicious vegan mushroom gravy I have ever had. Actually, I even like it better than traditional Thanksgiving gravy. Hope you enjoy this mushroom gravy as much as I did. It also tastes delicious on this cauliflower mash. Don't miss any of Ordinary Vegan's free recipes by signing up here. *if you don't like the idea of using a seasoning called poultry (although there is not poultry in the seasoning) - you can make your own by mixing together 2 teaspoons ground sage 1½ teaspoons ground thyme 1 teaspoon ground marjoram ¾ teaspoon ground rosemary ½ teaspoon nutmeg ½ teaspoon finely ground black pepper Store in a jar with a tight fitting lid. In a large sauce pan, heat ½ cup of vegetable broth. Add onion and mushrooms and saute three minutes. Add garlic and poultry seasoning and sauté until onion is translucent about another minute or two. Add red wine and cook one minute, stirring constantly. Stir in remaining 3 cups of broth and fresh herbs. Bring to a boil, reduce heat and simmer for 20 minutes. Meanwhile, in a small bowl, whisk together Tamari, nutritional yeast and flour to form a thick paste. Add mixture to pan, whisking constantly to make sure the paste dissolves. Bring to a boil and boil another minute, stirring constantly. Add salt, pepper and fresh sage. If you prefer it thicker, thicken with flour or cornstarch. 1 tablespoon flour (or cornstarch) to 1 tablespoon of water to make a paste and add. Keep adding and whisking to desired thickness. You can also puree this for a smoother gravy. Hope you enjoy it. Lovely recipe and Pem’s words are perfect advice. I’m adopted. Lived in an unhealthy home. I’ve learned I am my family! I reinvented my life. Best thing, if people are depressing and not supportive, is to stay away from them. We are not obligated to accept abuse even from family members. Happy Holidays. I could eat it every week too! It is so yummy isn’t it Patricia! Can’t wait to try this! My husband and I are vegan mostly. Working on that . Vegetarian always! We’re invited to a thanksgiving that is not vegan so this will be a perfect side to bring with our vegan mashed potatoes! Thank you so much! What if you don’t like mushrooms? Can I make it and remove the mushrooms? Or should I look for another recipe? Hi Elisabeth – if you don’t like mushrooms I don’t think this will work – I looked through my recipes and couldn’t come up with another one without mushrooms but you are not the only one so I will do some test recipes before xmas and see if I can come up with one. Thanks for being here and for being part of our healthy community! Made this tonight. It is amazing. So delicious. Thanks so much for the recipe. Thanks for catching that Di. I fixed it. How long will this stay in frig? Can it be frozen? New to Vegan life and at 70 years old never learned to cook. Thanks. This recipe is our new favorite – it is perfect! We were making a vegan gravy prior that was similar for cauliflower steaks, but I really enjoyed the omission of oil and vegan butter, making it both healthier and easier to digest. What an amazing flavor. I used a blend of the recommended portobellos with oyster and brown beech.